I’m talking today with Susan Woodring, author of Goliath (St. Martin’s Press, 2012) and two previous books, The Traveling Disease and Springtime on Mars. Read more about Susan on her website. For a chance to win a free copy of Goliath, read to the end of this post and look for the instructions. And check out this review of Goliath at Prime Number Magazine. Cliff Garstang: Goliath is set in a small North Carolina town dominated by a furniture manufacturer. How typical is the town? In what way is it representative of other small North Carolina towns? Susan Woodring: I’d say it’s very typical of a number of small furniture towns in this area in that everything revolves around the plant. When I lived in Lenoir, NC, home to Broyhill Furniture, I was surprised to learn that people celebrated Thanksgiving on Friday instead of Thursday since that was the day the plants closed down for the holiday. And, you could time traffic on highway 18 by the shift changes at the row of plants up that way. Walmart and the ABC store (our state-managed liquor stores) and the pool halls were always busiest every other Thursday afternoon—the plants’ payday. The entire town shut down the week of July 4th, when the factories stopped production for vacation. I live down the road a bit in Drexel now, and here, like in Goliath, the Post Office is where everybody sees everybody. Once, strapping my kids into their car seats after picking up our mail, a man stopped me. “You the writer?” he asked. He’d heard we had one. But, of course, I made up most of Goliath—I had to. The factory was gone by the time I moved here; only the building and a lot of talk—some proud and rather sad memories–survived. CG: The main character of the book, Rosamond, is very complex. On the one hand, she’s willful and determined, without regard for outward appearances. On the other hand, her behavior surely does cause a stir in the town. How do you see Rosamond? What was it like to spend so much time with a woman who some would consider flawed? SW: Cliff, thank you! I consider “very complex” to be a huge compliment! She was definitely interesting to work with, for the reasons you mentioned. I see her as being incredibly brave. She fights for her own happiness with a vigor I really admire. And yet her bravado is sort of late to bloom—she doesn’t really start to seek out the things she needs, let alone demand them, until she’s lost, in one way or another, everyone she loved. She is, as you said, flawed in many ways. She is harshly judged by others, but then, she judges others pretty harshly as well. I suppose what kept me connected to her was her willingness to fight for herself and for others—even those who were so unkind to her. CG: The inciting event of the book, the moment that sets everything in motion, is the discovery of the body of Percy Harding—Rosamond’s boss and the owner of the furniture manufacturer that holds the town together. The event has almost spiritual overtones, both for Rosamond and for the boy who discovers the body, and portends great changes. When you had young Vincent find the body, did you know what those changes were going to be? SW: I had thought I wanted to have two characters who were hugely and in opposing ways affected by Percy’s death. I felt the energy of the story would come from the velocity of their reactions and also how those reactions butted against each other. I didn’t know the particulars of what would happen, but I sensed early on that Vincent would go from innocence to destruction and that Rosamond would, conversely, go from a sort of personal ruination to redemption. CG: There are hardly any complete families in the book. Rosamond’s husband has left her; Percy is dead, leaving his wife alone; Rosamond’s neighbor is a widower; Rosamond’s daughter has left her husband; and so on. I wondered if that was meant to suggest a reason for what’s happening in the town—the social fabric unraveling? SW: I think that what’s happening in the town is the winding down of an era, which can be a really terrifying thing. One of the most heartbreaking aspects of the real-life drama of the closing of the furniture factories in this region was that it happened in both glacial slowness—rumors abounded for years—and with disorienting suddenness. Yesterday, we were doing the same jobs everyone we know has done for three or more generations, and today, they’re auctioning off the electric fans from the varnishing room. And yet, I also think there’s an inherent beauty in endings; here, we can pause and consider what we’ve done. The contributions we made. And by “we,” of course, I mean “they”—the factory workers. They made beautiful pieces of furniture, rich in aesthetic and function and also, profoundly solid. Solid and heavy—in today’s world, so full of plastic and disposable and flimsy, nonmaterial stuff zapped across the internet ether. But I also mean “we,” like you and me and everybody who has ever felt unmoored and maybe even outright bewildered by change. I don’t think of it so much as being the social fabric unraveling as a symptom of incompleteness. The factory is gone, your spouse is gone, or, you’re a child who has trouble connecting with your peers and your parents. You’re missing something. CG: The point of view of the novel is omniscient, although it retains a sense that it is actually the town telling the story. It’s an unusual point of view in contemporary fiction. Did you have a particular model in mind? What were the challenges you faced in writing from that point of view? SW: The opening section of Alice Hoffman’s The River King got me thinking about how omniscient could create this gorgeous distance between the reader, who’s way up in the sky with the all-seeing narrator, and the action below: such an interesting perspective, and such an artful way to give a whole-sale view of the town. Of course, there are a number of classics that model this quite nicely; there’s all the fog in the beginning of Dickens’ Bleak House. Also, I found Ian McEwan’s On Chesil Beach at the exact right moment, while I was working on this book. His first two sentences step into the story so elegantly. CG: Speaking of models, do you have particular influences in your writing, or writers you particularly admire? SW: To my mind, nobody puts a novel together quite like John Irving. He is my absolute favorite when it comes to novel architecture. Bret Lott is the master turning an ordinary-seeming moment into something beautiful and resonant. Lee Smith portrays her characters with such warmth and insight and her language is so beautiful. Annie Dillard and Marilynne Robinson are also true language-artists; each of their sentences is so intricately and gorgeously arranged. As Annie Dillard herself has said of a well-crafted sentence, Dillard’s and Robinson’s sentences are machines. Perfect. CG: Your first two books were published by small presses, but Goliath is from St. Martin’s. How have you found the transition from small to big press? SW: I feel that I’ve been extremely lucky all around. Press 53 really nourished me—and especially former editor Sheryl Monks, who worked closely with me on my story collection—and P53 editor Kevin Watson continues to support me and my work in so many ways. (He actually handed a free copy of my story collection to the man-who-would-become-my-agent about five minutes before my appointment with him at a writers’ conference. He bragged on me, said I was talented and easy to work with. Thank you, Kevin!) I am grateful for the opportunity to work with a bigger house now. It has opened some doors for me and Goliath, and I have really enjoyed working with my editor at St. Martin’s. She’s so smart. The book is better for her input, of course, but also I learned so much about the craft of novel-writing from working through her edits. CG: I think most readers are interested in process. I know you have children who keep you busy, so how do you get any writing done? Are you able to keep to a routine? SW: I have a routine—I get up early most mornings to write, plus I have two afternoons and one morning a week of childcare and most Saturdays for writing—but I think that the real key to writing with children (and/or other obstacles) is flexibility. One of my children wakes up early or the babysitter can’t come or we have a birthday party to attend on Saturday—it’s easy to get kind of prickly about these things or to despair, wondering if I’m ever going to get any real time for writing. But, what I have to do is let it go, enjoy my real life a little, and simply look for the next opportunity. CG: We got our MFAs in the same program at Queens University of Charlotte. What for you was the benefit of that program? Do you recommend that other writers get an MFA? SW: I think I learned how to turn a critical eye on my own work, which is of course crucial to the writer. One of the drawbacks for me is that I left the program with perhaps one or two too many critical voices inside my head. I had to learn to both let them have their say and ignore them altogether. I would also count developing a discipline and reading books I otherwise wouldn’t have to be among the benefits I enjoyed. Perhaps what’s most important is the circle of writing friends I came away with—you among them! Pursuing a career in writing is daunting to say the least—it’s really wonderful to have a community of like-minded masochists to retreat to. CG: Lastly, what are you working on now? SW: My agent is currently reading my latest effort, a novel which takes place in the mountains and includes a sort of modern-day leprechaun (which is so much fun to write about!). I’m also working on a few short stories right now which feels so wonderful. I’ve really missed them. Readers: To be entered for a chance to win an Advance Reading Copy copy of Goliath, there are 2 easy steps. (1) Leave a comment on this post, below; and (2) go to the upper right corner of the home page of this website and sign up for occasional (very infrequent) updates by email. And then return frequently to check for more book giveaways in the coming months. Great interview. Especially like the comments regarding editors and small presses and then later, the question to have or have not an MFA. I think some folks these days get carried away with the initials and lose sight of the real benefits of studying to be a writer (of which, I’m afraid I missed out on as I am MFA…less(?) but consider myself self-fine-arts educated:). Either way you go, everything Susan mentioned: the community, a critical eye, developing a discipline, reading other works that you might not otherwise all with the intent of becoming a better writer, which, I believe, is a lifestyle and not just a career block to check. Congratulations! You are the winner! I’ll contact you to get a mailing address. Great interview. It was a beautiful conversation. I loved reading about Susan’s writing process, the way she developed character and story and talked about the factory and way of life that was lost. 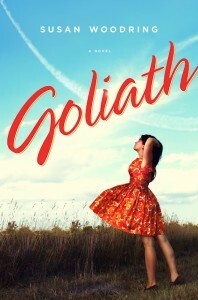 I look forward to reading Goliath! Thanks for this interview and sharing about this book. It sounds like a great read, and something I’m looking forward to. Congratulations, Susan, and thank you, Cliff, for asking intriguing and pertinent questions. I enjoyed the interview as a prospective reader, and as an in-the-trenches writer. Omniscience! Love it when it draws you in and floats you through the narrative, hopefully with occasional turbulence, white water, gators. Yeah, I said gators. I liked every question and every answer here, and I read every word, at least two times. I’ve been wanting to read Goliath for some time. When I used to live in North Carolina, I dated a guy from High Point and he would tell me what it was like working in a furniture factory, growing up, and we used to eat barbecue sandwiches a lot for lunch. Susan’s responses to these questions conjure up my curiosity again about what it’s like living in a furniture factory town and just plain outright human nature. But there’s nothing plain about it, is there? Just look at Susan’s answer to what it was like writing about the complex character Rosamond: “She is harshly judged by others, but then, she judges others pretty harshly as well. I suppose what kept me connected to her was her willingness to fight for herself and for others—even those who were so unkind to her.” I’d like to learn more from reading Susan’s writing about that kind of compassion and why so many of us have it. Can’t wait to read the book! I’m so glad to learn about a new writer (well, new to me). This looks like a book I would enjoy. I probably wouldn’t have known about it but for your review, Cliff, and the Goodreads post. Many thanks. Looking forward to Susan’s reading in Atlanta, Bound 2 B Books next Thursday! A very thoughtful interview. Creates interest and provides context. Well done. Nicely done interview! I don’t do too many, as I usually can’t think of what to ask 🙂 Thanks for inviting me to check out this giveaway! Wonderful interview, Cliff! So relaxed and informative, just like the two of you are sitting and speaking together. I’m very curious about Goliath now that I’ve read Susan’s response to your question about the omniscient viewpoint, a very challenging viewpoint in my mind, and one we don’t see enough of. You all have touched on so many subjects: the book itself, literary influences, MFA programs and the writing communities that arise from them, the benefits of working with a small press and now a large one, and balancing writing with life. A truly comprehensive, but compact interview! Great questions, Cliff, and as always, Susan’s answers were insightful and inspiring. Wonderful interview! I really like the part about the point of view and how even though it’s omniscient it feels like the town is telling the story. That makes me want to read the book even more. The other thing that draws me is the small town feel, where everyone knows everyone. Great question and answer about how a big industry like the furniture factories discovered affect the whole life of the town. Can’t wait! Now I really want to read the book. Susan’s insights on loss are key, I think. Totally awesome. The interview was so informative, it gave me an insight into things that I really don’t think about. It also gave a great idea of having a routine in one’s life. I am excited and looking forward to reading the book. Interesting interview. Thank you both for the discussion of so many aspects of writing and publication. I had earlier highlighted this book, thinking it a must-read. This interview confirms it. Congratulations, both of you, for a great interview. Thank you to everyone who participated! Our winner–determined by an online random number generator–is Steven Gilbert. Stay tuned for future contests. This was fun!